Home Price Gains Have Slowed Down | The Law Office of Emil Fleysher, P.A. Home Price Gains Have Slowed Down | The Law Office of Emil Fleysher, P.A. Nationwide, home prices have finally begun to level out after being driven up by investors. September brought on the slowest rise in home prices while providing decent sale gains and more variety in sale inventory. According to the Standard & Poor’s/Case-Shiller index of home prices in 20 major cities, September marked a 4.9 percent increase in comparison to a year ago but a 5.6 percent decrease compared to August. For the first time in seven months the 20-city index was unchanged. Nine of the 20 cities dropped home prices in August. However, the index doesn’t adjust for seasonal elements such as the drop in temperature which affects sales. In the past two years home prices have increased swiftly into the double digits. This is largely due to investors bidding up home prices but they have begun to slow down because there aren’t as many bargains. To assist in keeping prices down, many homeowners have put their properties up for sale. Lower mortgage and price gains have also allowed for the housing market to become more affordable. Throughout the country, during October there were 2.22 million properties on the market, which is an increase of 5.2 percent from last year. Numerous economists are thankful for the moderate gain after the turbulent downfall of the housing market and the double digit increases of 2012 and 2013. The Case-Shiller index accounts for nearly half of all U.S. Homes. It measures prices and checks them with those in January 2000 to create an average of three months. The latest figures are from September. Out of the 20 cities, 18 of them had slower price increases during a 12 month period. Miami reported the strongest annual gain with 10.3 percent, with Las Vegas at its heels with 9.1 percent. September marked the first time the Las Vegas posted a price increase under 10 percent for close to 24 months. Redfin, a real estate brokerage, stated that Miami’s sales went up 21.2 percent last month. This was the heftiest increase out of the 39 markets they track. Potential buyers received yet another incentive, lower mortgage rates. 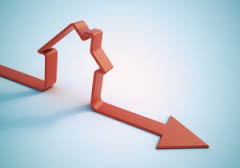 30-year fixed mortgage rates has decline to 3.99 percent from its 4.01 percent earlier in the year. Proof that the real estate market is picking up after the sluggish pace during spring time came in October where already existing home sales rose at its highest rate this year. However, because household incomes are not increasing as quickly as needed to adjust with inflations, it is making it particular hard for first-time home buyers to purchase. Many are being affected by the amount of student loan debt and are therefore just renting instead of buying. Last month along had only 29 percent first time buyers, which is well below the 40 percent they used to average before the housing market crashed.